The proponents of California’s Proposition 8 have asked the United States Supreme Court to review the landmark federal appeals court ruling in Perry v. Brown (now Hollingsworth v. Perry) that found Proposition 8 unconstitutional. Proposition 8 stripped gay and lesbian Californians of the fundamental freedom to marry. On June 5, 2012, the full Ninth Circuit denied Proponents’ request for an eleven-judge panel to rehear the case, known as rehearing en banc. 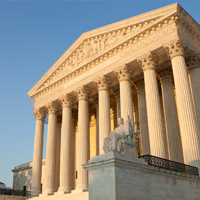 Proponents’ request for Supreme Court review, known as a petition for a writ of certiorari, is only granted upon an affirmative vote of four Justices.